Spencer "Hiko" Martin (born March 6, 1990), is a professional American Counter-Strike: Global Offensive player who most recently played for Rogue. He rose into prominence when his team finished third place in the first major CS:GO tournament at ESWC 2012 with the former Area51 Gaming lineup. He is mostly known for his lurking, solo site play, and clutching ability. On the side, Hiko was a staff member at Twitch from April of 2015 until November, 2018. When he was young, he was an avid football, hockey, and baseball player. Due to a hockey injury, he was unable to play sports for a summer, allowing him to dedicate significant time to gaming. Starting off with the Nintendo 64, he eventually moved over to games for PC, playing anything he could get his hands on. Hiko has mostly funneled his competitive gaming into Counter-Strike, with 1.5, 1.6, and CS:GO. He got into Counter-Strike through one of his friend's brothers, which ended up making his whole group of friends play the game. Hiko began playing Counter-Strike 1.6 at a competitive level in 2011 when he played for a team called Temporary, which had two of three of the famous North American trio: Danny "fRoD" Montaner and Tyler "Storm" Wood along with Dustin "dizzaman" Dilyerd and Frenchman David "Xp3" Garrido. Hiko and the rest of his teammates were acquired by CheckSix Gaming at the end of 2011 where they attended IEM VI Global Challenge New York. After failing to impress with CheckSix, Hiko found his way out of the team in favor of Matt "Warden" Dickens who emerged out of retirement to reunite with fRoD and Storm, whom he played with on compLexity Gaming and Evil Geniuses in the past. In 2012, Hiko moved straight over to Counter-Strike: Global Offensive during the beta stages of the game and would eventually join Area51 Gaming weeks before the game officially released. Hiko was joined by former Counter-Strike 1.6 members, Sean "sgares" Gares and Canadian Kory "Semphis" Friesen along with former Counter-Strike: Source players Sam "DaZeD" Marine and Trey "tck" Martin. They had no notable achievements other than winning the inaugural season of ESEA Invite over Team Dynamic, one of the best Counter-Strike: Source teams which chose to merge with former Counter-Strike 1.6 players to rival against Area51 Gaming in Global Offensive. The players would leave Area51 Gaming and join Quantic Gaming where they would acquire a 5th-6th placing at the Copenhagen Games 2013, with a loss to the utmost best team at the time, Ninjas in Pyjamas, in the grand finals of ESEA Season 13 - Global Invite Finals. Following these results, Quantic Gaming split up, but would acquire Hiko and Semphis' newly formed team, featuring sgares, Braxton "swag" Pierce, and Jordan "n0thing" Gilbert. Three months after, compLexity Gaming would acquire the team, entering the new title after competing in Counter-Strike 1.6.
compLexity Gaming would live up to its name not long after acquiring the players formerly of Quantic Gaming including Hiko, the team captain. The team would enjoy a variety of consistent top 4's and beyond even in international events, where the team made the semifinals of DreamHack Winter 2013 where they'd upset CIS superteam Astana Dragons in the quarterfinals before falling to eventual champions Fnatic. Their second major run at EMS One: Katowice 2014 was the worst result under compLexity Gaming but would still outperform compared to iBUYPOWER who had failed to make it out of the group stage at both majors. Following the major in Poland, swag was swapped out for iBUYPOWER's Todd "anger" Williams and later replaced by Michael "shroud" Grzesiek before Cloud9 would acquire the team. Cloud9 picked up compLexity Gaming prior to ESL One: Cologne 2014 but Cloud9 would not fail to impress for their debut into Counter-Strike: Global Offensive. Hiko & co. would upset Titan in their opening match closing out the game in overtime before upsetting Team Dignitas in a close Mirage game following a 2v5 with seang@res at 14-14 where caster Anders Blume would yell "Oh my god Hiko! Are you kidding me?!" following the successful clutch. Cloud9 would face eventual champions Ninjas in Pyjamas in their quarterfinal match which ended in close fashion but still remains with memories. Most notably, Hiko's flickshot where Hiko would rotate 180 degrees at Mid Doors on Dust II with just a P2000. The first bullet shot would go straight into Christopher "GeT_RiGhT" Alesund's head in the blink of an eye. Anders Blume's reaction on the broadcast would be "WHAT?! Oh my god, INHUMAN REACTIONS!". Cloud9 would unfortunately lose the map 16-14 and later Cobblestone 16-14, ending the Americans' major run with another quarterfinal finish. Then came DreamHack Winter 2014 following a string of poor results. Cloud9 would fail to impress on this occasion as the team would lose to CIS challengers, HellRaisers. They would recover and eliminate Bravado Gaming from South Africa with a 16-1 blowout before falling to Fnatic in the group stage decider where they would fail to make playoffs for the first time. Following an upset defeat from Denial eSports at ESEA Season 17: Global Invite Division, Hiko elected to leave Cloud9 and join rival team iBUYPOWER with Shahzeeb "ShahZaM" Khan replacing him on Cloud9. In December of 2014, Hiko would join iBUYPOWER - the rival team of Cloud9. The team of the red chimera were delivering better results at the time compared to the blue clouds up in the sky but at this point the players would leave iBUYPOWER and were awaiting an offer to join Evil Geniuses who were planning on entering Counter-Strike: Global Offensive after previously closing their Counter-Strike division in 2012 including the likes of n0thing in the past. Most ultimately, this did not happen in the end as Valve had caught DaZeD, swag and Keven "AZK" Lariviere in a match fixing scandal against NetcodeGuides.com. More information on the match fixing scandal can be found here. Following the scandal, Hiko remained a free agent while he was working for Twitch and streaming CS:GO on their website. During this time, he stood in for eLevate at CEVO Season 6: Professional along former GX teammate Tyler "Skadoodle" Latham. The American duo at the time were also in talks with Mikail "Maikelele" Bill, Adil "ScreaM" and Håvard "rain" Nygaard about forming an international European team which would go on to join Team Kinguin. The team including Hiko and Skadoodle did not go to fruition since the Americans would need to move to Europe to play and Skadoodle would go on to join Cloud9 to replace ShahZaM additionally. Hiko would go on to join Nihilum Gaming, reuniting with Semphis whom was also kicked from Cloud9 at the time Skadoodle joined. His new team were unable to live up to their name and were unable to gain good results causing Hiko to later leave the team. Not too long before, Hiko would get an offer to stand in for FlipSid3 Tactics from Ukraine at ESWC 2015 following Georgi "WorldEdit" Yaskin's visa issues making it to Canada. His ability to stand in was highly influenced by their star player, Oleksandr "s1mple" Kostyliev because he did not trust any of the other potential candidates FlipSid3 Tactics could acquire as a stand-in but Hiko. Fortunately for the team, they were still able to land a semifinal finish falling to Natus Vincere. In September 2015, not long after leaving Nihilum Gaming, Hiko joined Team Liquid. The team was founded earlier in the year after acquiring the Denial eSports team that upset Cloud9 at the end of 2014. Since then a few roster changes were made including the addition of Hiko but this would end up being one of the team's most successful changes in the long term as the team's results would flourish after Hiko's arrival including qualifying for DreamHack Cluj-Napoca 2015 where Hiko would first be met with autographed stickers. Despite the major not going in their favor at all including a close loss to Virtus.pro and another loss to Ninjas in Pyjamas, the team would continue to improve and even further upon acquiring s1mple in place of Jacob "FugLy" Medina. The addition of s1mple would eventually lead to the team's first major success including a semifinal at MLG Columbus 2016 before choking to Luminosity Gaming and North America's first finals appearance at a major in Cologne. Following the major in Germany, s1mple transferred to Natus Vincere due to him wanting to leave Team Liquid earlier in the year to join a European team again, and he would be replaced by Jacob "Pimp" Winneche from Denmark. At this point, Hiko's last days in Team Liquid were emerging as his performance deteriorated following s1mple's departure along with him being forced to in-game lead due to Valve's coaching nerfs post-Cologne. The team's results began to get worse with time and this would be shown most at the ELEAGUE Atlanta 2018 major where Team Liquid would lose their legend status after a close group stage where they would fall to eventual champions Astralis in the last round of the group stage. Hiko was given his marching orders in favor of former OpTic Gaming in-game leader Peter "stanislaw" Jarguz. Following the kick, Hiko would stand in for OpTic Gaming for a few events along with former Team Liquid coach Luis "peacemaker" Tadeu acting as interim coach for the team. Hiko's time with OpTic would come to end within a few weeks following poor results since stanislaw's departure to Hiko's former team. In the aftermath of Hiko's time standing in for the green wall, Hiko would host a livestream on Twitch talking about his experiences on Team Liquid and OpTic Gaming amongst other older events..
After nearly six months of being a free agent, Hiko would eventually join the ex-Enigma6 Group core under Rogue following the loss of the American organization's Danish team. The start of the team was a rough road due to the fact that Rogue only signed four players to begin their journey in North America before signing Matthew "Wardell" Bowman Yu not long after, but shortly after Wardell would return to his former team Ghost Gaming. 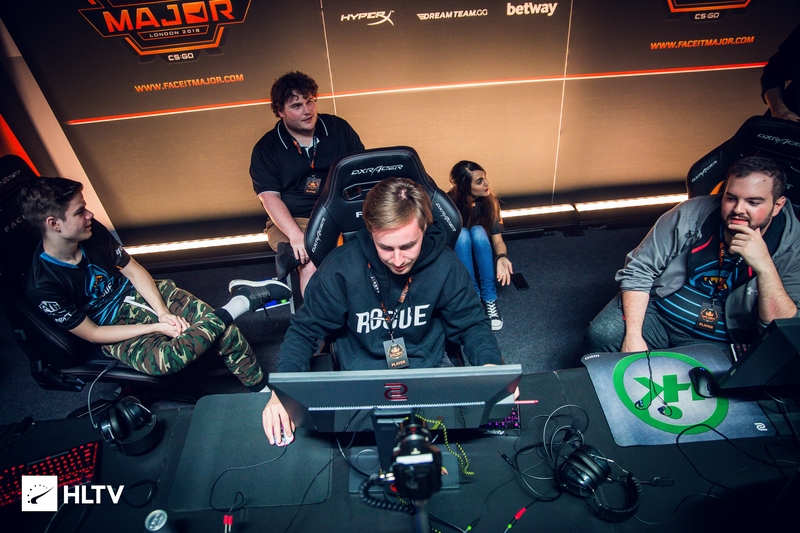 The team would eventually sign Casper "cadiaN" Møller from Rogue's former Danish team which would improve the results Rogue were getting ever so slightly but still not good enough. The community at the time would often criticise the team, mainly at Hiko saying "from a major finalist to this" implying Hiko was on a top team and made the finals of ESL One: Cologne 2016 and then moving down to a low level ESL Pro League team. Unfortunately on the ESL Pro League of things, Rogue placed 12th which meant the team were at risk of being relegated to ESEA Premier if they failed to pass the Relegation. This would additionally be Rogue's first LAN debut for their North American team and they would go on to pass the relegation and keep their place in the Pro League. Following this, Rogue would sign Ronnie "ryx" Bylicki and Hunter "SicK" Mims before replacing the former with Anthony "gMd" Gulmond and later Ricardo "Rickeh" Mulholland from Australia. Upon Rickeh's addition to Rogue saw an uprise in results from the North Americans and prior to this, Rogue were able to acquire some much needed experience from Copenhagen Games 2018 and despite not qualifying for the main event, they were able to win the Copenhagen Games 2018/Secondary_Tournament|Secondary Tournament over Vexed Gaming's UK team. The team has since gained consistently good results since Rickeh's addition including second places at DreamHack Open Austin 2018 and the Americas Minor ahead of FACEIT London 2018 which the team qualified for, but were unable to make it into the New Legends Stage following a triple overtime defeat to North. Following Rogue's failure to qualify for the New Legends Stage in London, cadiaN would join North with Kevin "kRYSTAL" Amend joining, later to be replaced by former North in-game leader Mathias "MSL" Lauridsen. Last updated on 2018-09-17 (214 days ago). Last updated on 2017-02-10 (798 days ago). He was chosen to be in the "All Star" MLG Columbus match for the American side. He revealed on stream that his favorite color is green. ↑ MIRAA. "Twitch sign CS:GO staff". HLTV. ↑ Hiko. "No longer working for @Twitch". ↑ 3.0 3.1 DeKay (2018-03-15). "CS:GO Roster Moves That Never Happened: That Time Hiko and Skadoodle Almost Joined an EU Superteam". DBLTAP. ↑ Luis "MIRAA" Mira (2015-04-29). "Cloud9 sign Skadoodle, fREAKAZOiD". HLTV.org. ↑ Hiko. "HIKO REAL TALK".